Try it risk free for 100 nights. Free shipping, Free returns. Providing a revitalizing rest with technologically advanced, American-made, eco-friendly mattresses. 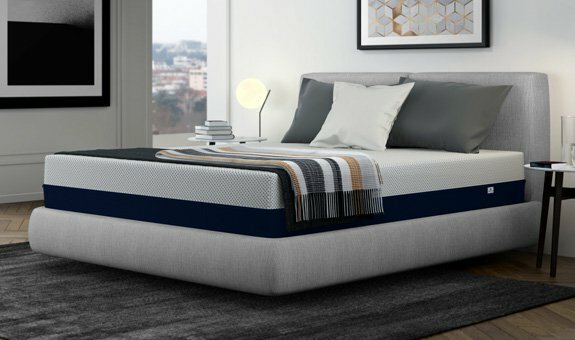 Every material we use in the construction of our mattresses is carefully sourced and selected for its unique performance characteristics. Our progressive layer technology ensures that every one of our mattresses is cool, comfortable and supportive for the best night’s sleep possible. We sell and ship products direct to you keeping prices down and reducing our carbon footprint. Straight out of the box mattress set-up is easy. Because we are not all the same, we have created different mattress variants for different sleeping styles. Crafted from high performance smart materials that have been clinically tested to enhance your sleep. Technologically advanced mattresses to suit your individual needs. "I was looking for a firm memory foam mattress that would reduce my chronic lower back pain. This mattress did the trick starting from the first nights sleep. It was a huge improvement in my comfort and quality of sleep." "We were using a Tempurpedic mattress and wanted to find a less expensive option. Since they give a 100 day trial, we decided to try it. This will be our permanent mattress. Its as comfortable as our previous mattress and better than our Select Comfort in our guest room." "We had a sleep number bed for about 5 years but were not as comfortable in the last year or so as we were at first. We shopped around and chose the Amerisleep and couldnt be happier. We went with a softer model and love it!" "Excellent product. Im a side sleeper and was having lower back problems with my old mattress. My lower back pain is now gone after the first month!" "I LOVE this mattress! I wake up feeling well rested and my back doesnt hurt when I wake up any more. Not only WOULD I recommend it, I tell all my friends already."